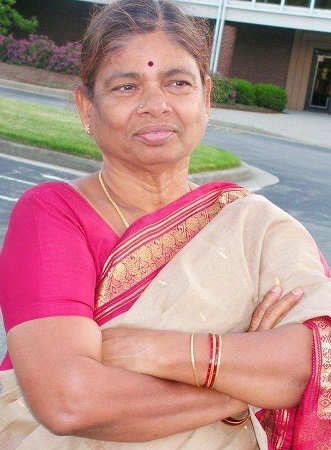 LAKSHMI REDDIVARI, 70, passed away Sunday April 7, 2019 at the University of Louisville Hospital. She was born in Kalikiri, Andhra Pradesa, India. She was a homemaker and was preceded in death by her husband: Chandrasekara Reddy Puli, her brother: Madanamohana Reddy Reddivari, and her son-in-law: Vijay K. Reddy. and 3 Grandchildren: Rohan and Lekha Reddy, and Tanvi Puli and many nieces and nephews. A celebration of Lakshmi’s life will be held at 11 AM Thursday April 11, 2019 at the Market Street Chapel of Naville & Seabrook Funeral Homes(1119 E. Market St.) followed by visitation with the family until 1 PM. Burial will then be in Charlestown Cemetery. Memorial Contributions may be given to The Hindu Temple of Kentucky. Final Rites (Pedda Karma) will be held on: Monday, April 15, 2019 at 13415 Cain Lane, Louisville, KY. Pooja starts at 10:30 am followed by Lunch.